Use a trusted brand of CD-R media—the all-new Microboards brand! The Shiny Silver CD-R media's surface allows for beautiful thermal printing. Designed with duplication in mind, Microboards' Shiny Silver CD-R Media is fully licensed by Philips. Record at speeds up to 52X, and store 700MB of date or 80 minutes of audio. Also available in White Inkjet. Use an economical yet trusted brand of CD-R media—the all-new Microboards brand! The Shiny Silver CD-R media's surface allows for beautiful thermal printing. 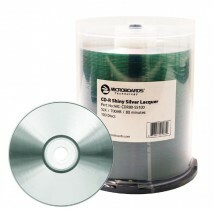 Designed with duplication in mind, Microboards' Shiny Silver CD-R Media is fully licensed by Philips. Record at speeds up to 52X, and store 700MB of data or 80 minutes of audio. Also available in White Inkjet. Capacity 700 MB / 80 min.